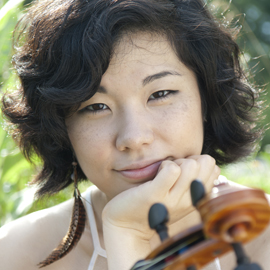 Violist AYANE KOZASA is the winner of the 2011 Primrose International Viola Competition, where she also was the recipient of the Mozart Award for best chamber music performance and Askim Award for her performance of the competitions commissioned work. As a result of winning the competition, she will be performing concerts in Europe and America. Her previous prizes also include the Irving M. Klein International String Competition. Most recently, she is a winner of Astral Artists 2012 National Auditions. Ayane Kozasa has attended numerous festivals including the Music from Angel Fires Young Artists Program, the Steans Music Institute at the Ravinia Festival, Aspen Music Festival, Mimir Chamber Music Festival, and the Norfolk Chamber Music Festival. During the summer of 2012, she will be attending the Marlboro Chamber Music Festival. Miss Kozasas interest in chamber music has led her to a number of concert appearances across the United States, including a national concert tour with pianist Ignat Solzhenitsyn as a part of Curtis on Tour. Most recently, she has been invited to be a part of Ravinias Steans on Tour for the 2012 and 2013 spring seasons. Other accomplishments include being a founding member of the Philadelphia based chamber group, ensemble39. Miss Kozasa also performs as a substitute in the viola section of the Philadelphia Orchestra. She has been heard in broadcasts for WHYY in Philadelphia and on the Mayne Stage for WFMT in Chicago, and has been featured in the Strad and Strings Magazines. Ayane recently graduated from the Curtis Institute of Music where she studied with violists Misha Amory and Roberto Diaz. At Curtis, she was the George and Marie Hecksher Annual Fellow. She received her Bachelors Degree in Music from the Cleveland Institute of Music studying with Kirsten Docter. She also studied violin with William Preucil while at CIM, and has worked with notable teachers such as Michael Tree, Nathan Cole, Cyrus Forough, and Philip Lewis.